He often celebrate our special days – birthdays, weddings, anniversaries, new beginnings and new additions by feasting or ‘treating’ our family, friends and social circle. While everyone has their way and manner of marking an occasion, what is the Shiv Yog way of marking moments of happiness? Shiv Yog Guru His Holiness Dr Avdhoot Shivanand says that the best way to celebrate joy is to multiply it. For this, he suggests distributing goodies, food and essential items to those not so privileged to afford them by fate. By distributing happiness, we not only increase our share of joy but also create an energy vibe of positivity around us, which in turn begets more love, happiness, blessing and success to us. Shiv Yog leads by example in this regard by organising feasts, food spreads and free buffet lunches on a mass scale in rural areas around the world, the most recent one by Shiv Yog Master Acharya Ishan Shivanand ji in California where more than 500 people feasted on the choicest of meals, snacks, fruits, juices and sweet dish. 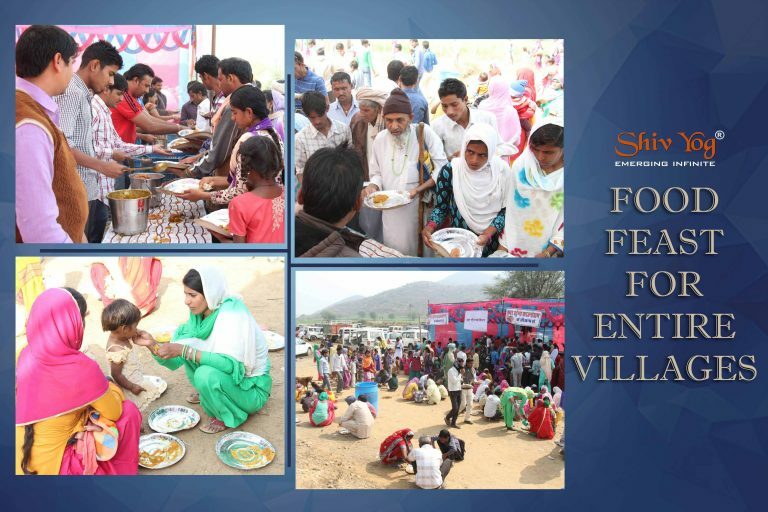 However, the centre of such food feasts continues to be the Alwar district of Rajasthan where Shiv Yog Volunteers travel from all across India to selflessly discharge their service towards feeding the human kind by erecting food stalls. Here, fresh food is prepared on the spot by the cook and served hot and fresh by the volunteers. There are a few interesting highlights of this programme – anyone can take as many servings as he/she may want, everyone is served with equal unconditional love and compassion, without discriminating on the based of religion, caste, age or gender, it serves as a great leveller and unifier for all as after serving the village folk and the needy, the volunteers – from all backgrounds – themselves eat the same food, sharing the same space and occasion with the village folk. Such food feasts are conducted to mark Shiv Yog Gurus’ birth anniversary and also various other spiritual events such as Shivratri, Diwali, Holi, New Year, onset of new season, Janmashtami, Full moon et al.